Full Employment Is More Than Possible. It Is Essential. Progressives have not only been able to beat back the D.C.-elite effort to cut Social Security, we put the idea of expanding Social Security on the table instead. We pushed LGBT rights and gay marriage and have won significant victories. Sunday’s Climate March will force climate onto the map. Now it’s time to put our demand for full employment policies on the table. And guess what – it’s a great way to win elections! What would it mean in people’s lives if there were more job openings than people? Right now people suffer terrible job fear that forces them to accept pay cuts, benefit cuts, extra hours and other things that increase profits for the giant corporations. Think about the huge change in the mood and structure of the country if employers had to fight to get employees. If your boss couldn’t find the people needed to do the work and knew that you had three job offers, you might be getting a raise instead of a pay cut – and you would know that, too. It has been a while, but imagine the situation in our economy if working people had the upper hand. This is what full employment would mean. And it is possible to achieve full employment – but only if We the People decide to just go ahead and pursue this, through our government. Government spending in a democracy is by definition things we do to make our lives better. This chart shows that it can do just that. In front of Congress right now there is H.R. 2821, the American Jobs Act. The American Jobs Act expands on that stimulus package and repeals the sequester. It does a number of things to improve conditions for workers, including cutting taxes for working Americans, restoring emergency unemployment insurance, investing in infrastructure, and helping to put unemployed Americans back to work. First and foremost, it gets started on fixing out infrastructure with grants for airport projects, air traffic control systems, highway and bridge rehabilitation, high-speed rail projects, Amtrak, and various other transit projects. Republican leadership is keeping this bill from a vote in the House because it would pass. There is a discharge petition to force it to come to a vote. Call your member of Congress ask tell them you want them to sign the discharge petition for H.R. 2821, the American Jobs Act. I wrote about a previous version of this bill in 2012. That version was also blocked by the Republicans. The bill aims to provide a job to anyone who wants one through a variety of means, including direct federal job creation. The effort would be paid for through a financial transactions tax on stock trades. It builds upon the current Humphrey-Hawkins full employment law, which requires the Federal Reserve to report to Congress on its efforts to balance job growth with suppressing inflation. Spending on infrastructure makes our economy better by 1) creating the jobs while the work is being done and 2) providing the public with an improved infrastructure that supports the economy. So let’s fix and modernize the country’s infrastructure. We have been deferring the needed work on infrastructure for decades. We are now so far behind that our roads, bridges, trains, schools, water systems, airports, dams, ports, parks, levees, inland waterways and the rest are literally falling apart. As of 2013 the estimate was that $3.6 trillion in spending is required. Republicans have been blocking that – even going to the wall by filibustering efforts to fix our infrastructure. Here are just a few examples of the hundreds of filibusters since Obama took office. We have fallen so far behind – the result of Republican anti-government policies that have drained We the People (government) of funds to even keep up with the basics. Corporate/conservative propaganda has also have drained us of the understanding that We the People through our government need to address our urgent problems. Tax cuts aren’t going to repair roads or build levees. “The market” isn’t going to prepare us for the effects of climate change. And the dominant, wealthy industries that fund the Republican Party – like oil and coal and Wall Street – are going to fight efforts to stop putting carbon into the air as well as the higher wages that will accompany the resulting full employment. Prepare for the impacts of climate change. Hurricane Sandy’s effect on New York City was a warning shot of what’s to come. This is a massive infrastructure effort to bolster ports, levees (especially in coastal areas), and other assets. It will also require enhanced disaster preparedness. Restructure our energy systems to cut the amount of carbon we put into the air. We have to move away from fossil fuels. This means an all-out effort to build wind, solar and other alternative energy sources. This effort will create hundreds of thousands of jobs. Retrofit buildings and homes to be energy-efficient. This is a massive effort to insulate walls, install double-paned windows, close up leaks, paint roofs white, and the rest of the things we need to do to stop wasting energy. These efforts alone – infrastructure, climate preparedness, transitioning from burning carbon and retrofitting for energy efficiency would create million of jobs. And these efforts would lay the foundation for the economy to boom in the future. But the jobs they create would also create jobs. People would be going to stores. Companies would be buying supplies. Republicans just love high unemployment. High unemployment means lower wages and scared people. How many times have Republicans been able to push their policies through by sing the “create jobs” myth? “Tax cuts create jobs” – they don’t. 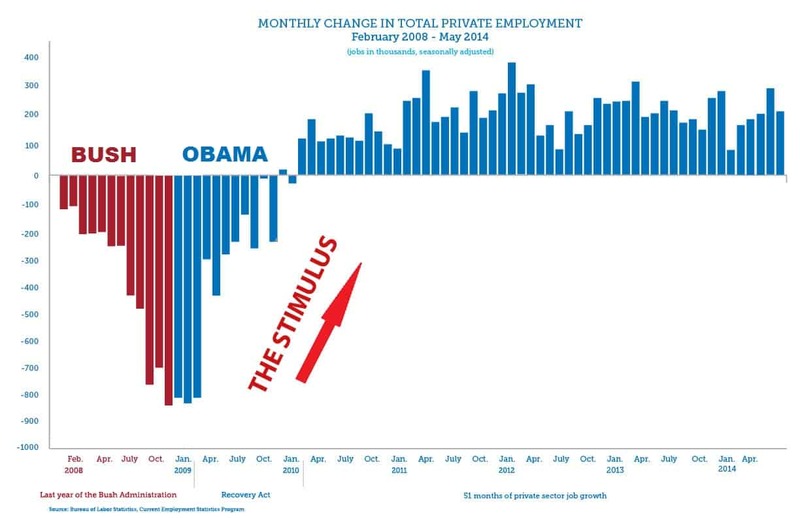 “Government spending kills jobs” – look at the stimulus jobs chart above. And on it goes. It is time to demand that our government create full employment. We were able to fight back against Social Security cuts. We were able to fight back against tax cuts for the rich and their corporations. We were able to fight for gay marriage and LGBT rights. We are fighting them on climate. We are fighting for women’s pay and health. It is time to demand full employment, too.